“Hey honey, let’s grab the bikes and check out Whitaker Ponds!” says absolutely no one, ever. 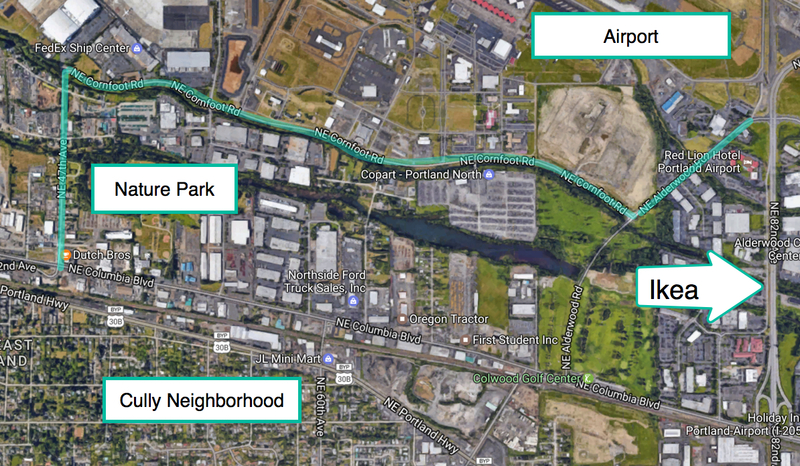 By next summer, Portlanders will have a new park they can bike to — and a popular route to the airport will be vastly improved. Furthermore, an industrial area with thousands of jobs will be easier to get to. If you don’t drive much you might not even know about Whitaker Ponds Nature Park. That’s because the 25-acre park is located north of Columbia Boulevard off of 47th Avenue — a place that’s all but inaccessible to people who walk and bike. Columbia is a dividing line in our bike network and our city in general. It acts like an urban freeway that runs east-west from I-84 to St. Johns, wreaking havoc on everyone who tries to use it outside of a car or truck (a 15-year-old was nearly killed on the street last August). 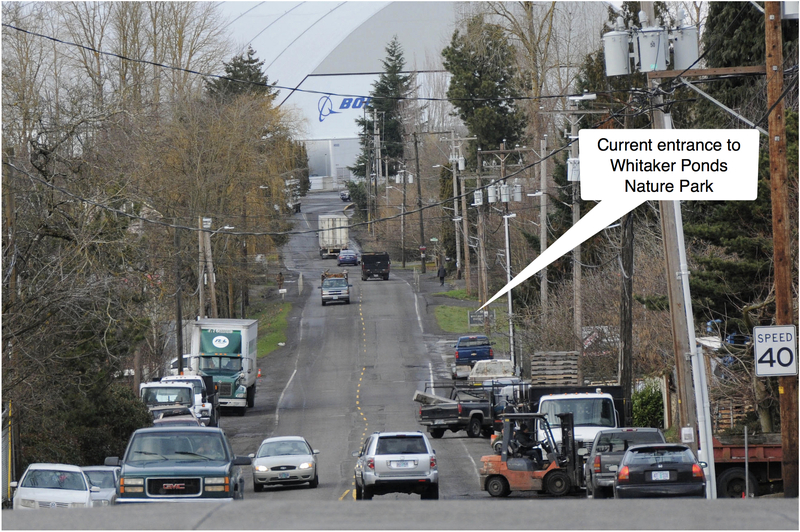 And 47th Avenue north of the Cully Neighborhood doesn’t offer much of a respite even after you cross Columbia. But several projects in the works will make this part of our city much more inviting to vulnerable road users. This month the City of Portland and the Columbia Slough Watershed Council will break ground on a project to improve the Whitaker Pond’s 47th Avenue entrance. 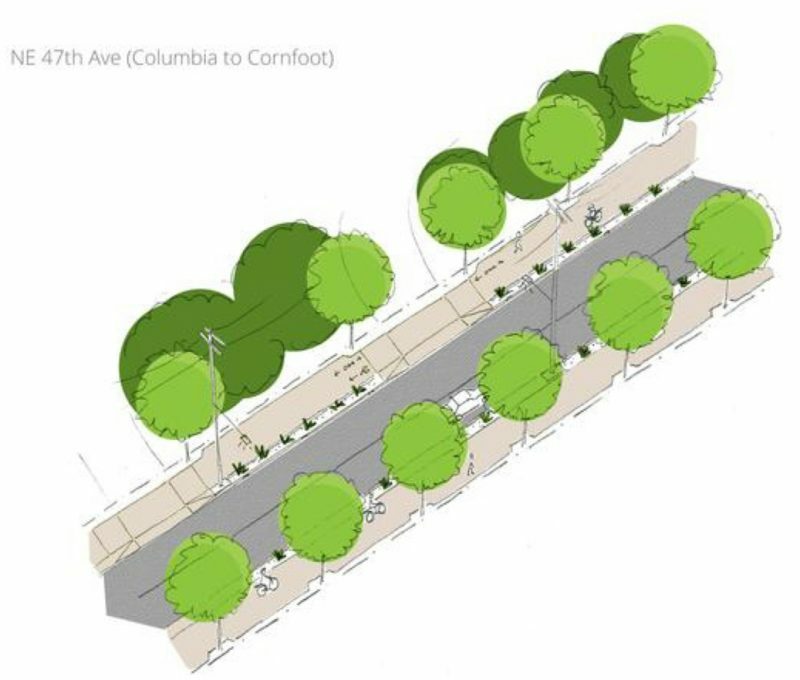 And next spring, the City will begin a major rebuild of 47th from Columbia to Cornfoot Road that will include new sidewalks, street trees, and protected bike lanes in each direction. Two future projects — a bike path on Cornfoot and bike access upgrades on 42nd/47th south of Columbia — are planned but still unfunded. 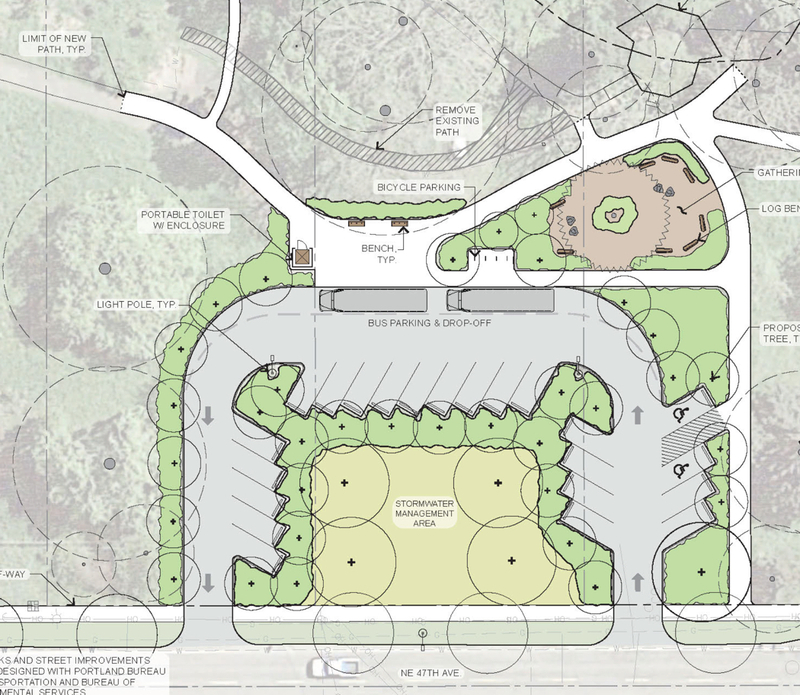 The park entrance project will include sidewalks, a parking lot, a bike parking area, new landscaping, and upgrades to educational facilities (it’s a popular spot for school field trips). Funding for the project comes from Parks Bureau system development charges (SDCs) and a $422,000 grant from Metro’s Nature in Neighborhoods program. 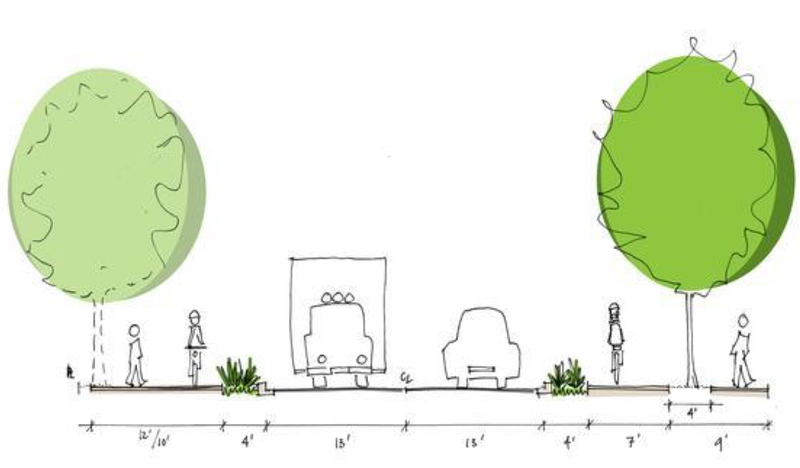 PBOT design drawing of future 47th Ave cross-section. 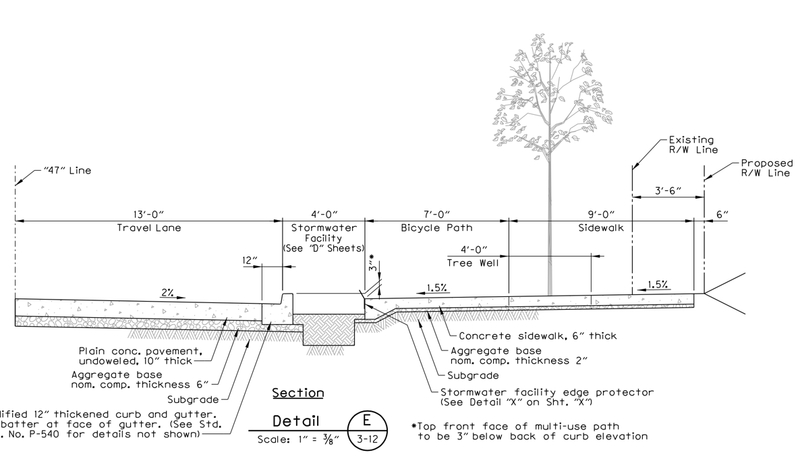 Future cross-section of 47th near entrance to Whitaker Ponds. There are two other projects in the pipeline that will help get you from neighborhoods south of Columbia to the airport (and related destinations like the Ikea shopping center). 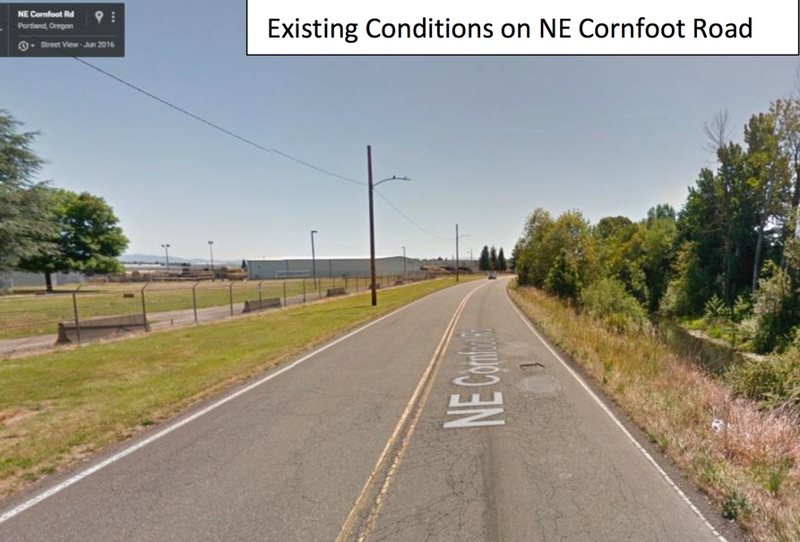 The Port of Portland is supporting a project that would build 1.2 miles of multi-use path on the north side of Cornfoot Road from 47th to Alderwood. 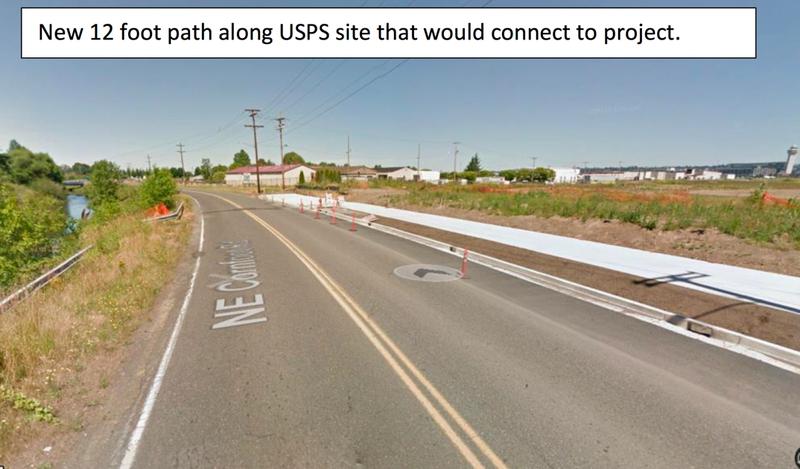 The path would be 14-feet wide and would connect to an existing piece of path recently built at a US Postal Service site near the intersection of Alderwood and Cornfoot (see below). This project has an estimated cost of $3.1 million and just narrowly missed being selected for Metro’s last round of regional flexible funding. It’s also on the list of projects to receive PBOT SDCs. Part of the future Cornfoot Road path is already built. Another project on that Transportation SDC list that relates to this area is a $3.7 million project that would replace the 42nd/47th Avenue overcrossing (of Lombard/Hwy 30) bridge and add a new bikeway to the bridge and road from Killingsworth to Columbia. Once all these projects are done, Portlanders will have a much safer way to bike from northeast neighborhoods to the airport and beyond. 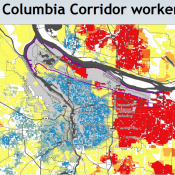 With over 12,000 jobs at the Portland Airport alone, and another 20,000 jobs in the area bounded by 33rd Avenue, I-205, Columbia Blvd and the Columbia River, these connections to residential areas south of Columbia Blvd are vital. Ha! Has there been anything Kyle B. hasn’t hated? I know I won’t ride to a place like that for fun. I would describe that entire area as industrial wasteland which is not interesting from a visual or terrain point of view and there’s not any opportunity to just spin. Traffic on some of those roads is heavy and speeds are higher than in most areas of town. I expect most people would find the ride out there intimidating. I’m more intrigued by airport access though to be honest, lack of secure bike storage and luggage issues are bigger barriers to people riding in than the roads even if those aren’t awesome. Honestly, I’d take packed dirt over the current terrifying situation up there. Concrete sounds great. Also, maybe the color difference is a good visual indicator that it’s not for motor vehicle traffic? Yeah, color difference is the only plus side IMO to using concrete for raised cycleways. The Dutch, of course, solved this problem long ago by dying asphalt red to denote cycleways. Interesting. I’ve never liked the way the green lanes can get a little slippery in the rain. I wonder if red dye is better than green paint for that. I have noticed that PBOT has recently started “roughing up” the green thermoplastic surfaces on new installations and that appears to help with the slipperiness. The red-dyed asphalt is still much better, though. Dye is much better from a traction point of view. It is much less prominent in low visibility situations. The thermoplastic looks great but the traction isn’t nearly as good as “normal” surfaces and gets worse fast in slippery conditions. It seems especially bad in frozen fog. Roughing up thermoplastic improves traction somewhat but has other disadvantages. Cornfoot will need all the help it can get once the new central Post Office comes online.. semi’s galore. There already are plenty of big rigs, there’s a FedEx facility and a bunch of air freight companies in the area now, and USPS is only going to make it worse. Considering that the WNBR is starting at Fernhill Park, I hope it maybe explores some of this territory to introduce some people to it. Then again, that’s pretty unpopulated territory and wouldn’t be as fun to ride for the purposes of WNBR. YES! Finally, I work at Horizon Air’s Flight Ops center and this has been my nightmare especially at night when either leaving or riding to work. Many co-workers who live in the ‘couv say they want to start commuting but are afraid of all the current truck traffic on Cornfoot and with the above mentioned Postal Office coming the truck traffic is going to only get worse. Plus there are plenty of people at work who want to either walk or run at lunch time but haven’t had a safe way to get to the park. I’m glad for the road improvements, but as a birdwatcher the revamp of Whitaker is actually kind of a shame. Whitaker Ponds is one of the best birdwatching locations and habitats in the Portland Metro, and part of that is no doubt due to its remoteness and “unkempt” wildness. And birds are one of our most vulnerable earth-users. I’m hoping that they do not alter the trails too much. Part of what makes the south side of it in particular so unique is the winding dense woods. Shout out to the PBOT project manager Andrew Aebi, who found a way to align SDC revenue and LID funding from both Parks & Rec and BES to cover part of the 47th Avenue project, and then the rest by coordinating the construction to coincide with a BES sanitary sewer line install and a water main replacement with the Water Bureau. Some truly impressive inter-agency coordination went into this. The City is really lucky to have Andrew as an employee. I’ve ridden that street to the airport dozens of times- I had no idea I was riding past a park. This is shockingly good news! Going from really bad to really good. I often bike or walk this section of 47th to get to a production facility off of Cornfoot, and it is frightening at best. Why the different configs north vs southbound? Clearly they have different space available, but seems like the available space could be equally distributed to get a good config both ways. Even better, drop the 13′ lanes down to 12′ (still plenty for the semis) and have more room to play with. The part of NE that’s east of 47th and north of 84 still has awful connectivity – right now the only option is to take that awful stretch of Cully between Killingsworth and Columbia. I dream of 72nd connecting to Alderwood via a bike/ped bridge over Columbia. This would connect the new Cully Park to whatever will become of Colwood Golf Course (which the city is supposed to turn into a smaller golf course and park space). This will probably remain a dream. Is this new park / natural area going to have trails? Will it accommodate mountain bike access? 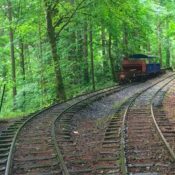 Its amazing how often improvements equate to less access for those who wish to use the park. I’m all for safer access via bike, but I would also like to access nature on my bike. Pretty soon we will have paved everything over in Portland and our natural access will be a distant memory. The park is small (just 600′ x 1900′), flat, not much dry land, mostly ponds and wetlands. Not particularly interesting for mountain bike trails, unless someone wants to ride a MTB in a 600 foot circle over and over. Not suitable for mountain bikes trails either, from an environmental point of view, I’d think. While I agree that this small park is not a destination, I think its important to include opportunity for trail access, so that a longer ride would be possible with many sections. The irony of paving more and then not planning for park access will ultimately lead to less nature opportunity. Yes, safe bike lanes are positive. There is no reason that park programming here couldn’t also include multiuse trails rather than the status quo of hiker only. The slough has many options to have a nature loop. Its ironic that we pave bike paths everywhere but don’t include natural options in our planning. 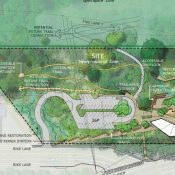 This park could link to the slough, rocky butte, and Gateway Green. It could be a patch of green in a city wide hiking / biking network for natural surface narrow trails. Its time to think big. When the city buys a mile long strip of land between 47th and Gateway Green and makes it into a continuous park, then we can revisit putting MTB trails in Whitaker Pond. Until then, there’s no point in putting a 600 foot long bit of MTB trail that goes nowhere. If someone really wants to ride their MTB around the pond, just ride on the footpath. It’ll be too boring to do more than once. The city will NEVER create continuous parkland that allows mountain bikes. The city may however, create/maintain green spaces for nature appreciation in appropriate intervals so that one could ride 50% on trail and 50% on greenways/ bike lanes. Every plan that involves park land should account for nature conservancy, pedestrian/bike use, and wildlife habitat. It is short-sighted to continue to plan park land without multiuse opportunities. I agree with you. I’d NEVER utilize this space for a ride, but some neighbors might. We shouldn’t discount the value of having natural areas for people to appreciate. This is fantastic! 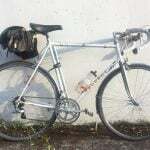 For over a decade I have been riding my Bike Friday Tikit folding bike (with mini trailer) to the airport from NoPo, and the stretch of 47th and Cornfoot is scary! Most of the worst interactions I have had with motor vehicles in Portland has been with big rig and other truck drivers on Cornfoot, especially early morning, even though I am hugging the shoulder and hammering pot holes. I can’t keep track of how many really close calls and hostile moments I have experienced along that stretch of roadway. 22 spaces for cars, parking for 2 buses. And 4 staples for bicycles. Sounds about right. I say we boycott the comments section until JM agrees to allow emojis. You did it. Why have I never been able to get mine to show up? I keep trying to do the hair flip and nail polish emojis! You have to type out the text equivalent and WordPress apparently will convert it into an emoji for you. If only there was a text equivalent to the nail polish. It’s my go to reaction when I’m amused by people getting upset with each other about something ridiculous. I’d be happy to allow emojis! I’ll ask our web team how to make it happen. If you know of any good wordpress plugins to allow emojis in comments let me know. This is great, but the real problem is the segment of NE 47th/42nd between NE Holman and NE Columbia–it’s truly a death trap. Narrow, winding, terribly potholed, no shoulders, no ped OR bike access, AND it’s on the Trimet 75 bus route. I was nearly hit on my bike by a bus that was taking the curve. I see from this article that it’s on the city’s radar, and in line for SDC money, but why on earth can’t the city find a way to fund the fix for this deadly section NOW, at the same time as the NE 47th improvements? It’s ludicrous to have a major improvement on 47th with no connectivity to bike lanes or paths either north (Cornfoot) or south (42nd/47th). And the same goes for funding the Cornfoot path. Thanks. Cornfoot is the worst leg of the ride to PDX airport or Ikea for me. I almost got hit by a truck there a couple months ago. Driver leaned on the horn, I rode off the road, they whooshed on by. Mr./Ms. driver obviously wasn’t watching the road. I don’t like roads where each and ever driver need to make the conscious choice to watch out the windshield the move out of their lane to make sure they don’t run me over. It’s a preference for me to have a bike lane or a multiuse path. This will make bike-to-fly a real, viable option for the 18 to 68 crowd. 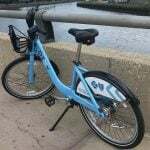 It’s only a 34 minute ride from my house near Williams and Fremont to PDX. Only a few minutes longer than driving. With that dicey Cornfoot Rd. piece fixed I’ll be much more inclined to ride to and from the airport. It’s pretty convenient. This is great news. I ride 47th semi-regularly and it always feels a bit dicey. A year later and haven’t seen much construction, Any update on where this project is in it’s timeline?